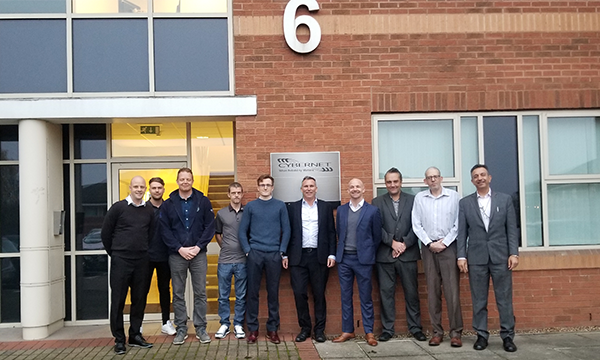 Irvine, CA 11/30/18 – Cybernet Manufacturing has recently announced the expansion of their European division, recently moving locations to better accommodate their rapidly expanding team in the United Kingdom. The Cybernet office in the United Kingdom serves the entire European market with both sales and technical support, and has recently added several new team members to their staff. The growth comes on the heels of a recent contract won with the United Kingdom’s National Health System in Milton Keynes. They will be using the CyberMed NB24 hot swap battery powered computer with their non-powered medical carts. Thanks to a successful deployment, Cybernet is anticipating further penetration within the UK’s National Health System. The European division has also made recent headway with medical device manufacturers on the continent, winning several new contracts. Having a dedicated team based in the United Kingdom has helped Cybernet reduce lead times for these customers compared to previous vendors, and the high reliability of Cybernet’s medical grade computers is starting to catch the attention of other OEMs. The UK team just recently returned from the Medica Word Forum in Dusseldorf, Germany. While there, they met with a number of medical device manufacturers and healthcare facilities. Events like these will help Cybernet continue to expand their market share and increase brand awareness in the region.